Kathy & Fabio have combined their extensive experience in the knitting, customs & logistics industries to become a leading importer and distributor of quality knitting yarns. The yarns are imported from all over the world, and they also offer a great range of pattern designs. For the new website we established a product based website with a clean layout that is modern and easy to use. Using the built-in product variant feature gives the products great looking product pages that allow you to visually choose and identify the various colours available in each yarn type. 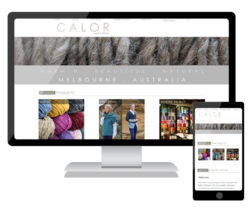 Be sure to check out the website, and if you are looking for a yarn wholesaler give Kathy and the team a call. Web Design Melbourne Located in Melbourne's eastern suburbs and interested in our web design services for your business? Call us now (03) 9801 4202.